I wasn't sure where to put this, so if it's in the wrong place, please feel free to move it. Equality is a concept that Iâ€™ve always struggled to come to terms with on NHE but have never felt comfortable bringing up... It is such a significant aspect of the foundation of their philosophy that Iâ€™ve been afraid my questioning it would be perceived as a â€œthreatâ€ and that everyone would instinctively jump to its defense rather than really explaining where theyâ€™re coming from and why they believe what they do. So this is where Iâ€™m stuckâ€”I do believe it is morally acceptable for a human to maintain the role of â€œalphaâ€ with their horse, but I do not believe that this entitles them to abuse, punishment, or cruelty. And I am perfectly fine being stuck here , as it suits me and doesnâ€™t at all conflict with my belief that horses possess dignity and ought to be treated respectfully. But this would surely put a frown on the face on NHE, as it defies what they believe. And while I respect their right to believe that horses are equal to humans, I also feel that I should enjoy that same rightâ€”to believe what I choose to be true for myself in this area, and not to be criticized for holding that belief. But this is not about NHE, so Iâ€™m going to move away from this apparent preoccupation. Another thing that I feel complicates the notion of equality is the fact that horses are herd animals, and therefore donâ€™t instinctively apply this concept in their interaction with other beingsâ€”in my experience, a pecking order is always established among one or more horsesâ€¦ contrary to what one might think, it creates harmony and understanding within the group and avoids unnecessary strife. I am perfectly fine allowing my horse to tell me what he is comfortable with and what he is not (and respecting him), but in a herd setting, I believe horses also exercise free-choiceâ€¦ usually the pecking order is nothing more than a mutual understanding that only creates tension when someone rattles the grain bucket. A poor lead-in to my discussion, as I'm still pretty conflicted over this, but I wanted to provide some questions to maybe ponder and answer if you feel so inclined. Truthfully, do you think your horse believes you are his equal? Is our goal (or could or goal potentially be) in working with horses to mimic their â€œnaturalâ€ environment by providing them with the same social experience that they share with other horses? Do you think this would be a constructive (/rewarding, productive, etc.) goal to maintain? Can the role of alpha (as defined below) be attained in such a manner respectful of the horseâ€™s dignity? Do you believe this is morally acceptable? Why or why not? The "alpha," as I see it, should assume a leadership position that is deliberately considerate of the horse and his state of mind, and acts only in the best interest of the relationship as a whole. Ultimately, I believe this role to be one of responsibility rather than entitlement or privilage. Last edited by rayne on Wed Sep 03, 2008 7:59 pm, edited 1 time in total. I've struggled with that long and hard too, untill I read a book by Imke Spilker and the penny dropped. Of course there are all the NH methods who emphasize that every horse in a herd has a strict place in the hierarchy - but it's not as strict as they want us to believe. Imke Spilker in her book pointed out that horses also have a very important and basic concept that overrules every vertical stratigraphy in the herd: play. The most humble foal can mock attack the lead mare or stallion, and unequally ranked horses can run along and play together and together rise above the dominance-ideas that normally structure the herd. When we think our horses fight for dominance (or when we are told that they are fighting for dominance), most of the time the horses are really playing, wrestling for fun. If you've seen stallions or other horses fight for real once, you know that all the running along, biting each others mane, rearing and bucking with more quiet pauses in between really is play, not serious dominance fighting. that for me really opened up my ideas on training, also on the leadership part within a training: play is only possible when both parties agree and both parties play fair. Whenever one party crosses the line (by becoming too pushy or by becoming too boring (guilty )) then the other party can break off the play, by walking away or responding with real anger/aggression. For me that was a real sigh of relief, because that's what I had done all the time before, but never had really understood or felt comfortable with: NH trainers would tell me I was too soft because I let the ponies go their own way and ignore my cues, while NHE would have chastised me for every now and then really sticking up for my borders, turning a cue into an order when Blacky or Sjors became too pushy etc. For me it was a real eyeopener to realise that horses also played, not just fought for dominance and priviliges and other tough stuff all the time - and then I felt realllly stupid for not having realised that for all those years - every time when I saw Blacky and Sjors play and mock-fight every day again, for ten years long,..
First, I don't think the practice of Parelli necessarily means one has a one-sided, people catering relationsip with their horses. In all methods or techniques, the individual always influences the application of the knowledge they gain. Some will indeed be as concerned with the well being of their horses as many here are. In fact, there are parelli people here and I sure wouldn't want them to think that they are more or less than I am, who does not pracitce Parelli, but who has benefitted from time to time, from the knowledge they sell. That said, of course it is an individual thing - not only among people, but among horses as well. For people, the definitions of the terms will vary. For the horse, the perception of the relationship will vary from individual to individual. I consider myself a leader to my horses. I don't personally use the term alpha, but I suppose I could. So I do absolutely believe that "alpha" can be achieved while respecting the horse's dignity. If I didn't believe this, I wouldn't be here. I don't know that morals come into this other than on a very personal and individual level. I think a truly equal relationship isn't possible, simply because we confine our horses and we ourselves are not confined. We make decisions for them at times without consulting them. Not that we could specifically consult them, but you know what I mean. Sometimes things must be done, whether the horse wants it or not. In other words, my horse can tell me that his teeth hurt him, but he's not going to suggest I call the vet and have his teeth floated. And horses need to be trained to accept this, or be drugged. They have no say in it. My horse would gladly kill himsef in a field of lush green grass and die a very happy horse. But I won't let him do that...and that, only, because I somehow believe a longer, healthy life is somehow better, and my belief trumps his. For a creature that lives only in the moment, I'm not sure I have the real right to make that kind of call if I wish to be 100% equal. So there again, I'm pulling rank and telling him that he has to live a long time and be my friend whether he likes it or not. But as respectful stewards, we can certainly take their opinions into consideration in circumstances that are not life and death. To whatever extent we wish, on an individual basis, we can listen to our horses, "hear" or see what they have to say, and agree to abide by that. You know that in return, they will often agree to abide by our suggestions as well. So it really is too complex and individual a topic to come to any kind of consensus. It comes down to personal belief. Is it possible? Yes. Do I do it? Partly. Karen; I have not finished reading your response, but your point about Parelli is very relevant, and I do want to appologize for what I said in my original post--I have not really done Parelli (I've studied only part of level 1) so I was approaching the statement that I had made pretty narrow-mindedly. I agree that many people who study Parelli do harbor a genuine interest in the well-being of their horse, and perhaps I came off a little too harsh or judgemental. So I will go edit it and try to be more mindful of others in the future. A topic that I found very interesting and actually had started a discussion on the NHE forum around February this year. I would like to discuss it in two steps. 1st. Are horses equal to us and if so, how is that to be understood? 2nd. Do horses have a dominance hierarchy? As I was for about a year very active on the NHE forum and school, I did get a lot of inspiration for my "research" and contemplations from there. That is why I would like to start from those discussions there. AN does believe in the dominance hierarchy, one can read that in some of his articles. But in NHE it is taught, that a horse does not see a human as a horse, therefore it does make no sense to try to be "alpha". The reps also believe in horses being dominant (following AN). They did utter warnings now and then in their advice, that a horse did "try to dominate" and that one should not let that happen. That is why I started the discussion back then and it was made clear, that my believes were not conform with NHE. When I stopped to use the dominance concept to explain behavior of horses, I had to come up with other explanations. It is a shift in thinking. For example as Miriam wrote, it might just be play. When it is about fighting for food, that shows only, which horse values food more. We confine our horses in relatively small areas, some just get cranky when they have not enough room for themselves. Dominance hierarchies are typical for humans. Yet, there are many people I highly respect out there, who do (still) have the dominance concept in their heads. Now back to the 1st point. Are horses equal to us and what does that actually mean? AN calls himself teacher and the horses schoolboys. Some compare it like parents and kids. I think, on the international side this point was difficult to understand. Sometimes people from the russian side made it clear, that of course there has to be discipline and boundaries respected by the horse. So one might see a contradiction. That means all life should be equally respected and I believe all life is intelligent and has some kind of feelings. But in an other understanding of equal, I would say: No one is equal. We are all different. For me that means: I respect the horse and therefore the horse should respect me. I do not violate the horses boundaries, so that the horse will also respect my boundaries. And so on. On the other side, I am responsible for the well being of the horse, as I did invite him into my environment, where there are cars, machines, too lush pastures and all kinds of other dangers. So I have to educate the horse for his own safety, do exercises and what else is needed for his health in mind and body. To use the word equal alone is just not enough for me, one needs to define it more, or would have to use two different words (English is not perfect for philosophical discussions - or at least I do not know any such two words, German would have more precise words). Teacher and student are equals in a way, and then they are not equal at all in an other way. Anyway he argues for animals interests to be given equal consideration as long as they have a capacity for suffering and enjoyment. And that denying animals equal rights is the same as racism or sexism. What I would like to know however is what you do when animal and human interests conflict?? I think that most of what AND does with horses gets pretty close to that. Allowing the horse a say in the training process is giving his interests consideration - He can show he is stiff, bored, happy etc. I agree we can be the leader (i.e the one to say, lets do this now) just like between friends there will be one person who says "lets do this.." and the other will be happy to go along. Friends can have mutual respect (eg. not hurting eachother) without us seeing them in a heirachy where one is dominant. When a horse gets too pushy I think it is fine that we say no- we are looking after our own interests, we don't want to get hurt (as long as we don't hurt them in return). Things like teeth, feet, vets, diet etc are us presuming to know the horses interests better than they do themselves. I think that in that case the parent analogy is a good one. That we are sort of their protectors. It is only natural to look after yourself be it animal, human or plant that threatens your well being. It is up to each and every one individually to choose wisely for them selves and other's well being. For example, that is why a lot of people are vegetarian or buy against animal testing. It is about not abusing the fact that you can choose for others. I do not see picking orders in establishd herds. What I do see is a clear culture of family bounds and relationships. I see young(er) horses looking up to wiser ones. I see bullies or anti social horses be ignored and left alone untill they get the picture. Then they are rewarded with attention and care. And above all, you do not take the alpha role, you receive it for being the most caring, for proven that you are a good choice as alpha by your actions that serve the herd well. A human designed 'herd' that changes on an off ussually has a bully, not an alpha. You see emotionally distressed, clueless 'on being horse' like horses, living together in to small spaces, lacking the nutrition they need. A whole different set of values and interaction goes in action than with an established (almost) free herd with grass and plant to their leasure. No. We humans lack so many things still, we lost them somehow in the last 12.000 years... But I do think it is coming back slowly. Maybe one day we will be their equals again. For now, we can only work hard in finding our selves and hope we can have just a bit of the awarness horses have. Th fact that we live in a human created world with our horses does make it so that we humans have to make a lot of choices for the horse's protection. Horses do understand that more then we think. View yourself living in the jungle under the protection of wolves... would you leave them even if you could? Not knowing were to go and all other predators having their eyes on you? I use to think a lot about these things... being an animal rights activist. The world is as it is. It changes... I believe for the better. I love my horses and I make the choices for them I have to make (as human and horse in human world) with my heart. From that moment on, I was invited in my small and yes unnatural herd. I have felt a part of a group, a family with values and a clear culture. A human part of horse world. Standing together in the sun... Our eyes closed, one head above me, on head below me. One watching over me, one expecting I was watching over him. I heard a noise, I expected to be disturbed, I looked up and my breath became heavy, they looked up to, in the same direction breathing heavy. It was not what I thought it was, my annoyance left me and my breath sank to my belly again... and so did theirs and we went back in to the snooze, one head above me, one head below me. You do not know what the rules of the ceremony are... what to do? Just be still and quiet, and watch and follow the others. Feel humble and found of everybody in the room, trusting that they forgive you for being foreign to this and let you make your mistakes. They only expect respect for their culture and family. And when you have that, you'll be fine and you'll enjoy your tea and company! For me, alpha, being equal, training, making choices... all these matters become very simple no matter with what species you interact... the moment it becomes matters of the heart and not of the mind. Josepha, you always have beautiful words, always filled with compassion and respect for the animals and the world around you, thankyou. I personaly think that this is one of the most interesting subjects in the horse/human connection. Dominance....should we be dominant over our horses, should we let him do as he wishes???? I have in the last seven years of being around horses worked my way through all of these questions, often quite painfuly!! I think that this is a process that we are all working through on a personal level, look to each of us here, to a greater or lesser degree we are all working through this in our own particular way. On my personal journey with horses, (to a certain degree I am lucky as I had never been near horses too much before getting Storm as a foal) I knew straight away that this was a leanrning journey, he came to me in a strange way, I think a sign that I was ready to learn more about myself. I did take the advice of many around me at the time who were all telling me to be dominant, or else my horse would be dominant over me. Well this just led my poor young boy to react negatively to me, not realy wanting to be around me, running away when he saw me approaching with a head coller. So as he grew up, and I was still being bomarded with advice from so many different quarters, all meaning well obviously, I decided to go towards Natural Horsemanship. First of all I thought this was wonderful, my horse became more respectful, when the halter was on he would move everywhere with me, I remember the young girl who came out and showed me various techniques to get my horse to move here and then there with various pressure applied to my horse, I winced as she shook the line, and my boy closed his eyes at the discomfort and ran backwards, but, he was now doing what I wanted him to do, so why was all still not right? He still didn't want to be around me, I would sit in the field and he would take himself to the other end and graze. Then one day I got so sad with all of this, my horse that I had dreamed of as a child didn't like me, didn't want to be near me, I had rubbed him groomed him, kissed and hugged him, but still he didn't know how much I loved him. I sat staring at him one day and decided for a while to just leave everything, just leave anyform of training, I had become so obbsessed with training methods, my head was whirling. I just sat everyday, watched him, groomed him, asked nothing, by now quite a few years of mad training sessions had passed between Storm and I and I knew it would take a long time for us both to meet on some sort of level ground, my brain was ticking, I was watching him, I was learning, then one day it hit me, 'BANG' out of the blue, I had spent so much time and money learning from various teachers, when all along my teacher was here, standing in front of me, calling me, but my ears were too tightly shut to hear. All the stares, all the conflicting body language, they were all messages from him, 'listen to me, listen to ME. Well I'm here now and I'm listening, and all the messages I get are, respect me, and I will give you respect, I hear him telling me to let go of strict rules of control, just relax, none of it matters. I then came accross AN on a computer hunt about other people who had at last acheived real harmony with their horses, I saw this man playing with these horses, I was shocked, stunned. Play, is this the secret to unlocking the horses heart? I will always thank Alexander Nevzorov for handing me that key. Like I said earlier, this is a personal journey, I offer a snippit of mine with these amazing animals. Are you ready to give up the control, your horse is offering you a hand to learn so much. You learn about yourself, he makes you see things in yourself, why am I so controling of things around me? Is it my fear? He teaches you to relax and have fun, and then you can carry this into other areas of your life too, the transformation can be amazing, you give your horse freedom, and in return, you have freedom, your river is once again flowing with laughter and happiness. I watched a programme the other day about a group of wolves. It was so fasinating, these animals are so intelligent, the way they interacted was so obvious, so natural and so needed for there survival. But what realy struck me, and made me realise how much we as humans can learn from animals if only we could listen to them more, was one wolf, a very quiet wolf, very low in ranking, but had incredibly wise eyes. Whenever this wolf sensed aggression or a fight arising he would immediatly jump in and initiate play, and then the whole group would end up running around and playing, this was his way of diffusing stressful moments. Just amazing, so intelligent, and so obvious. So with my horses now, they are all so mellow, of course they still scrap with eachother from time to time, after all they are horses, but I don't need to be dominant, even at feeding time everyone just waits quietly for there buckets, the dynamics have changed so much. This is my horse/human relationship, the one I've learn't on my journey. It's for everyone to find theirs on their journey, but just remember who the teacher is. What an interesting discussion, it is something that I have struggled with in the past. I read so many books and listened to many people before realising that I should listen to my horses. The different relationships I have with each of my horses has made me realise that there are many answers to the question. My wisest horse Sher Khan is 19 years, he has always been with me. With him I feel like the student and he the teacher, it is hard to explain but he always does the right thing. It may not be what I ask from him but if I stand back and assess the situation I understand that he has good reason. He is such a kind and gentle horse and is always trying to nudge me in the right direction. I do not need to act the leader with him, in fact if I did it would distress him but at the same time he does not try to dominate me. We play together or just stand and enjoy each others company with him I feel totally safe. At times my young stallion Gouch does try to dominate me even though it is a kind of play. If I do not take action and guide him in the right direction it turns to aggression. 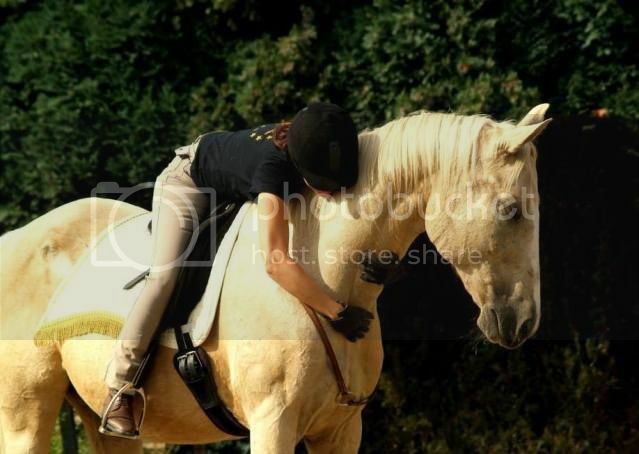 With him it is because he is a young horse who still needs to understand that there are boundaries. Just as I would not rush and try to beat him up he has to realise that he must not do that to me. I do not think of dominating him , more I see myself as the teacher and he the student. So with one horse I am the student and with the other I am the teacher, with my other horses it is a mix of these relationships. But apart from this I think the leadership changes every time. Atreyu even is always the alpha mare over me and has been for years. I don't interact with my horses within any herd environment because I'm not in a herd with them, I'm human and away most of the time. So I interact like human and horse. The way I do so is like in a good relationship. Everyone decides what he/she knows best. Like you would let your boyfriend decide the sort of pipes used for the plumbing and you would decide on the fabric of the curtains (to put it in a standard role pattern ). And we both ask and offer exercises, and try not to bump into each other Just like good friends, not even thinking about who is leading and who is following. I do not think that my horses and I are equal. For one we are very different beings, so where will it lead us to wonder about equality? We do share certain characteristics and we differ from each other in others. Our rights and tasks are shared according to this. One of the things we share is that we are living beings and with that, besides our basic needs (food etc. ), we need a certain amount of agency. So I am very careful neither to take away too much of theirs nor to completely give away mine. But there are many diffences between us as well. I try to incorporate them into our living together so that everyone decides according to what is beneficial for him (and us!) and according to his judging capacities. I do know more about the human-dominated environment we are living in, so I am responsible to watch for our safety. My horses do not know that it is dangerous to run around freely with all the streets and cars, so I keep them in a pasture unless I am with them. They know more about their own feelings and capabilities, so they have a huge share in deciding about what we are doing together in our work and play. I do not know by myself what exercises they can/want to do at any given moment, so I make suggestions but the decision is theirs. We train at liberty (or with a lunge line around the neck when we are outside) and they can decide what they want to do and what they do not want. And then there are things that we decide together or where we are taking turns, because each of us is capable of making good decisions about that - like where to go on our walks. I am not sure how much practical implications the question about being equal or not being equal has. For me the question is more how to make the best out of the life we have, and that means that I don't ask myself that much if it is their or my right to decide about certain things, but to ask who can make the better decision in a given situation. We don't have the same knowledge, so we don't have the same rights. But, and that is the important point for me, we both do have rights and spheres of competence. Maybe more because we are different than because we are equal. I must say, however, that I have no desire for equality. If I tried to be the equal of a horse then I would have to become a horse, and I prefer to stay who I am. If I tried to make a horse be my equal, then the horse would have to become human, and I don't want that either. I rather try to achieve a kind of parity or balance. I think my horse should "be the boss" of all things equine, and I should "be the boss" of all things human. So he teaches me about "the horse place" - which grass is best for eating, which path is good for which gait, which direction to turn when the wind blows hard, where is the best sand to roll in. I teach him about "the human place" - how to view vehicles, other people, other pets, various items of equipment, composure in unnatural circumstances. We each have different areas of expertise and need to establish a way to share that knowledge. That makes a big space where we can meet - the "horse and human" place. This is where I try to meet my horse, and have him meet me. Together we try to become a new thing which is neither horse nor human, but a blend of (hopefully) the best of both of us. There are times when I am required to be dominant, particularly safety issues, and there are times when he is required to be dominant, particularly when I am being "deaf" or "stupid" as his senses far exceed mine. I'm not sure how much sense this all makes, but it's how I feel. I think my horse should "be the boss" of all things equine, and I should "be the boss" of all things human. This is absolutely beautiful and clear! Thank you Glen. Very interesting discussion and I have to say that I've never been on a forum where everyone expresses themselves so very, very well. I loved reading this topic. There are minor differences in how everyone sees this but I would expect that, given that we all have different horses, different setups etc. To me the most important thing is that this topic is discussed openly and honestly because every time I meet a new horse my perspective will have to change a little.